The train service between Oslo and Gardermoen Airport is operated by a subsidiary company, NSB Gardermobanen AS, and marketed as 'Flytoget'. The Linx company, jointly owned by SJ and NSB, which operated services between Norway and Sweden, was liquidated and ceased operations on 8 January 2005. Since then, through services Stockholm - Oslo have been operated by SJ. Oslo - Göteborg is operated by NSB in cooperation with Svenska Tågkompaniet (TKAB), and in 2007 NSB acquired full ownership of TKAB. The ‘Nabotåget’ trains between Trondheim and Östersund are operated by Veolia Transport on behalf of Z-trafik AB, the transport authority of the Jämtland region. Competition is to be introduced on main line passenger services. Invitations to tender for the first passenger train operating contract were issued to prequalified bidders by Jernbanedirektoratet on 12 October 2017, when the national railway agency also announced plans for further competitive tendering. This first contract, Lot 1 Sør, covers inter-city services on the Sørlandet line to Stavanger and Jær line local services from Stavanger and Arendal. The contract was awarded to Go-Ahead Norge AS on 30 October 2018 and will come into effect on 15 December 2019. Norwegian. There are two forms of Norwegian, Bokmål and Nynorsk. Bokmål predominates, with Nynorsk used mainly in western fjord and central mountain areas. A list with individual PDFs is available here. The working timetable is available on the Bane NOR website here. Tjenesterutebøker for rutetermin R18 contains timetables by operator in train number order, which makes it difficult to find individual trains. However they do not appear to be times for 2018. NSB does not publish a single comprehensive timetable or printed leaflets. The "Rutebok for Norge" is no longer printed; It is available only on line rutebok.no. Work on the railway. For weather reasons, the major engineering work takes place in the summer season (25 June to 5 August 2018). Note that engineering work is scheduled on the Stavanger-Moi line from 09 December 2018 - 28 February 2019 See, Lillestrøm-Kongsvinger from 2 January-12 April 2019 See and R11 between Skien and Larvik after 18.00 M-F and weekends all day. There are numerous maps of particular lines and complex areas in "Norwegian Railways from Stephenson to high speed" by Roy Owen. Thorsten Büker's Map of Scandinavia NB Not updated since October 2011. Seat reservations are essential on most long-distance trains and reserved seats are not indicated as such. Many carriages in Oslo suburban trains are reserved for season ticket holders between the hours of 04:00 and 20:00 Mondays to Fridays. These are indicated by prominent yellow signs on the carriage doors. On some services First and Second Class accommodation has been redesignated Økonomiklasse (Economy) and Kontorklasse (Business), but on many trains only Second or Economy Class is provided. First or Kontorklasse accommodation is generally not indicated by a yellow stripe on the outside of vehicles. Couchettes are not provided on internal overnight trains, but sleeping cars have up to three berths per compartment. Premium fares are charged on the Flytoget "Airport Express" service between Drammen, Oslo and Gardermoen Airport, InterRail and similar tickets are not valid. In addition, ordinary NSB trains run between Oslo and the Airport twice hourly. ENTUR, a company owned by the Norwegian Ministry of Transport and Communications, took over from NSB the sale of tickets at stations in October 2018 as part of the government’s effort to create a level playing field for all passenger operators. Infrastructure is owned and managed by a public authority, Bane NOR. Right, but almost all lines in Norway outside the Oslo suburban area are single track. The best source is the Network Statement Stations and Lines. None, but iron ore trains to Narvik are operated by Malmtrafik AS (and Swedish company Malmtrafik AB) which is a wholly owned subsidiary of Swedish mining company LKAB. Passenger trains between Narvik and Sweden are again now operated by SJ, which had formed a subsidiary SJ Norrlandståg which won the contract back. Trains on the Flåm branch are operated by NSB, but commercial responsibility for the service rests with Flåm Utvikling, a company owned by local councils. Rail cycling is possible on a number of lines; see the IG Draisinenfahrten website. Click on 'International', followed by 'Draisinenlinks' to obtain website details under the heading 'Draisinenstrecken in Norwegen (NO)'. Details of the Metro system with maps appear in Robert Schwandl's "Tram Atlas Nordeuropa"; ISBN 978-3-936573-41-1, 2013. Details of these Tram systems with maps and track diagrams appear in Robert Schwandl's "Tram Atlas Nordeuropa"; ISBN 978-3-936573-41-1, 2013. 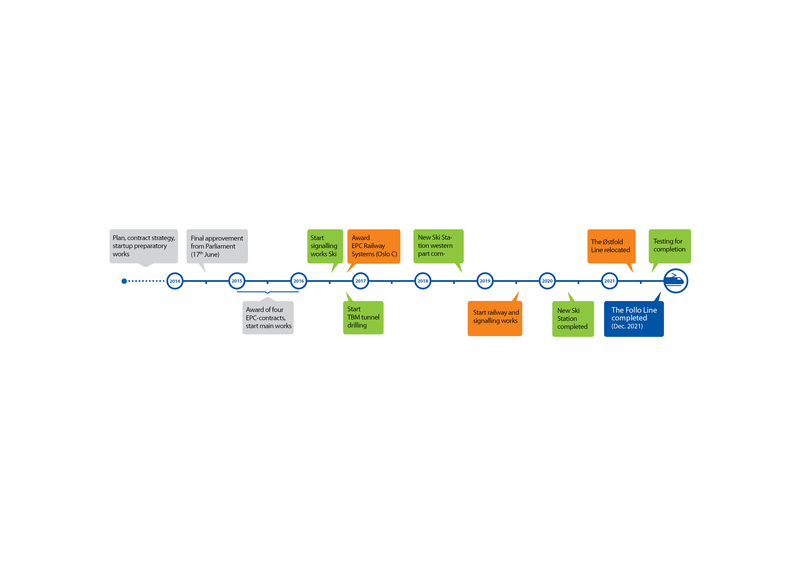 A track plan for the Trondheim tram system is available on the Gleisplanweb site. In January 2017 the responsibilities of the public rail authority Jernbaneverket were split. A new organisation Bane NOR deals with day to day management of infrastructure, while a Government Railway Directorate is responsible for the specification and management of main line passenger services. It is intended to introduce competitive tendering of passenger services during 2017. The 22.5 km new double-track Larvik (Farriseidet) - Porsgrunn line, part of the Vestfoldbane Project, opened on 24 September 2018. In March 2018 Finland and Norway chose Rovaniemi to Kirkenes (near the Russian border) as the best route for the potential Arctic rail link from northern Finland to the Barents Sea coast. Further studies will now take place, to be completed in December 2018. Bergen's light rail line, Bybanen, between Byparken in the city and Nesttun, opened on 22 June 2010, extended to Rådal (Lagunen) opened on 22 June 2013 and to Birkelandsskiftet on 15 August 2016. A further two-stop extension to Bergen Airport, Flesland, opened on 22 April 2017. The depot is at Kronstad. A film of the route is available. A second route from Kaigaten to Fyllingsdalen has been approved by the city council. Construction should start in 2018, with completion in 2022. The most recent extension of Oslo T-Banen (= Metro) was the Lørenbane (Line 4), linking Sinsen on the Ring Line with Økern on the Vestli line, which opened on 3 April 2016; this resulted in several changes to line numbers. Smestad – Åsjordet opened 18 August 2008, extended to Gjønnes by December 2012, and completed to Kolsås on 12 October 2014. T-Banen had been extended to form a circle (lines 4/6) on 21 August 2006 when Storo – Carl Berners plass opened; the first section, Ullevål Stadion – Storo, opened on 20 August 2003. The Kolsås line (line 2) has been rebuilt to full Metro standard. Mysen - Rakkestad was reopened on 14 December 2015 after a year long closure. Drammen – Tønsberg – Larvik – Porsgrunn (Vestfoldbanen Project): 2016 Intercity Plan has double track to Tonsberg for completion by 2024-2026 and onwards to Larvik by 2032. By June 2015 the upgraded Drammen to Holm section was in use. The 14.3 km Holm – Holmestrand – Nykirke cut-off, including a replacement underground station replacing the existing line through Holmestrand opened on 28 November 2016. The realigned and double tracked Barkåker – Tønsberg tunnel section was formally opened on 19 November 2011. The new connections result in services now using the complete circle round Tønsberg in the opposite direction to that previously taken - see Maps and Plans - Norway. Bane NOR is planning a new double track route from Drammen to Kobbervikdalen with new stations in Drammen and Gulskogen, for completion in 2024. The route was published for public consultation on 12 December 2017, with a deadline of 5 February 2018. Two more are being constructed between Skøyen and Asker. The first section, Sandvika – Asker, was completed in 2005; rebuilding of Lysaker station was completed in 2009; the new Baerum Tunnel between Lysaker and Sandvika opened on 28 August 2011; the original Lysaker - Sandvika line reopened on 13 December 2015 after being closed for 15 months for reconstruction. Work on the last section, Skøyen – Lysaker, was due to start in 2015 at the earliest. Doubling of Eidsvoll - Hamar (the Dovre line) on a new alignment is planned by 2024, with the Minnesund - Steinsrud section jointly with the E6 road development. A new 17 km double track route from Langset (just north of Minnesund) to Kleverud (south of Espa) opened on 1 December 2015. Oslo - Bergen: Contracts were let in October 2013 for doubling of Arna - Bergen, with a new tunnel between Arna and Fløen. In December 2015 the government announced plans to double the main line and reconstruct the section between Arna and Voss, starting with the Arna - Stangehlle section, mostly in tunnel to overcome problems caused by avalanches and mud slides. A ceremony in the suburb of Fløen on August 29 2017 marked the breakthrough of the 7•8 km Ulriken tunnel, which Bane NOR claims is the first main line railway tunnel in the country to be bored by tunnel boring machine. Planned to complement the existing single track tunnel, the new tunnel is expected to see its first trains in 2020. A new double track line between Gulskogen and Hokksund eliminating the current route through Steinberg plus a cut off between Sandvika and Honefoss were included in the Approved 2018-2023 Transport Plan. Electrification of Støren - Røros - Elverum - Hamar and Kongsvinger has been recommended as a means of providing increased capacity for freight between Trondheim and southern Norway / Sweden. The Norwegian parliament approved funding in December 2015 for planning the doubling of Narvik - Kiruna. Services on the branch from Hjuskebø reverted to the original Notodden station in August 2015, having used a new station (alongside the bus terminal and closer to the town centre but on an unelectrified spur line) since 25 August 2004. The entire branch had been threatened with closure at the December 2014 timetable change but funding was obtained to maintain service to Notodden until 2017. Although that funding was stated to include electrification of the spur to the 2004 station, this seems not to have been progressed. Extensive re-alignments and new lines have been built to improve journey times. The line from Oslo to Sarpsborg via Moss has been rebuilt over much of its length. Work on the Bergen line has included construction of a long tunnel below the summit at Finse. Doubling of Stavanger – Sandnes was completed 14 December 2009. The Setesdalsbanen tourist line was extended from Beihølen to Røyknes in 2004 and an extension within Røyknes opened on 5 September 2008. The Gardermobanen from Oslo to Eidsvoll via the Romeriksporten tunnel, Lillestrøm and Gardermoen Airport opened and passenger traffic between Dal and Eidsvoll by the Hovedbanen, the old main line, was withdrawn on 13 June 2004. The old line remains open for freight traffic. The existing Larvik (Farriseidet) - Porsgrunn line closed on 7 August 2018, in preparation for the opening of the new line. The existing line between Hommelvik and Hell via Muruvik closed with the opening of the Gevingåsen Tunnel on 15 August 2011. Passenger traffic was withdrawn south of Rakkestad (on the line from Oslo to Sarpsborg via Mysen) on 15 June 2003 and between Mysen and Rakkestad on 14 December 2014 - although the latter section reopened exactly a year later. This line will be used as the proving ground for ERTMS. NSB carriages do not work outside Norway and Sweden because they are larger than UIC standard loading gauge. The following lines are listed as temporarily closed to traffic; infrastructure is maintained only enough to allow inspection by a measuring vehicle. The following lines are listed as closed to traffic; they are not part of the National Norwegian Network and are not maintained. However track is in situ. Additional vowels come at the end of the Norwegian alphabet, with Æ, Ø and Å following Z in that order. Accordingly, Åsen comes last in the index of Norwegian railway stations and Mære is further down the list than Mysen.